Click to view Texas Rep. Sid Miller's endorsement of Justice David Medina. Justice David Medina's endorsements for his re-election to the Texas Supreme Court, Place 4 keep growing in numbers. Click to view the list here. 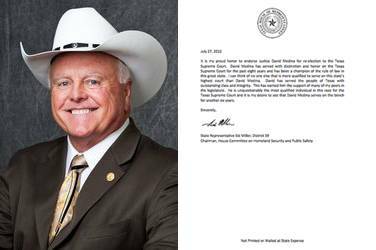 Recently, State Representative Sid Miller, Chair of the House Committee on Homeland Security and Public Safety, and author of HB15, the Sonogram bill, has endorsed David Medina for re-election to the Texas Supreme Court. Representative Miller joins his peers in the legislature and many other conservative elected officials, organizations, and leaders across the State of Texas in support of David Medina. Their message reads loud and clear, alongside many other conservative individuals and organizations. All of them wish to see someone who is committed to the rule of law sit on the highest court in Texas and take a stand against judicial activists that legislate from the bench. They have all spoken: the most qualified person to do this is David Medina. For more information, go to TexansForMedina.org. Click here for more articles regarding the race for Texas Supreme Court, Place 4.